IFA 2018: B&O adopts radical design for Edge wireless speaker with AirPlay 2 and voice control | What Hi-Fi? 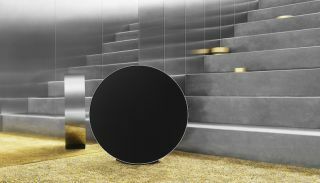 B&O Edge is a Bluetooth wireless speaker with Airplay 2 and Chromecast and its shape is based on the British pound coin. Trust Bang & Olufsen to do things a bit differently. It's no surprise that its take on the voice-controlled wireless speaker breaks from the norm, and in this instance its £2900 Edge certainly looks different. Designed by Michael Anastassiades, whose work is featured in collections in the Museum of Modern Art, New York and the V&A in London, the Edge is based on the shape of the British pound coin (presumably before it changed from a circular shape to one with 11 sides). It can sit upright on the floor or hang from a wall. If it sits on the floor, you can gently roll the Edge left or right to adjust the volume. A gentle movement will increase or decrease the volume moderately, while a stronger push will do so in larger incerements. Afterwards it will automatically return to its original position. The circular aluminium casework contains a single 10in bass driver, plus a 4in midrange unit and three-quarter inch tweeter on each side. Active Bass Port technology increases the level of bass as you turn up the volume. The result, claims B&O, is "a 360-degree room-filling sound from both sides of the speaker". Additional control is through a touch interface built into the surface of the aluminium surround, or the B&O smartphone app. Proximity sensors detect when you approach the speaker and automatically illuminate the touch controls. Voice control can be added either through a connected Amazon Echo device or Google Assistant-enabled speaker, such as the B&O BeoSound 1 and 2. The speaker comes with a black fabric cover as standard. Other colours will become available in due course. It will be on sale from mid-November for £2900.